I accepted Secret Storms : A Mother and Daughter, Lost then Found for review because it is a story of adoption. My second-born is adopted from South Korea and although his birth mother is on an different continent, the possibility does exist that she will want to find him someday and/or that he will want to find her. I think that's only natural and we're not opposed to this happening at some point in time. (We would plan to help him when and if he ever feels the desire to locate her.) I always want him to know that he is fully loved here, so much so that he should feel the freedom to be able to seek out his birth mother if he desires it. I think I probably would want to find my birth mother were I adopted, so I do not begrudge this of him. Julie spent 46 years wanting to know what had happened to her's and Frank's first born, the little girl who she had named Aimee. 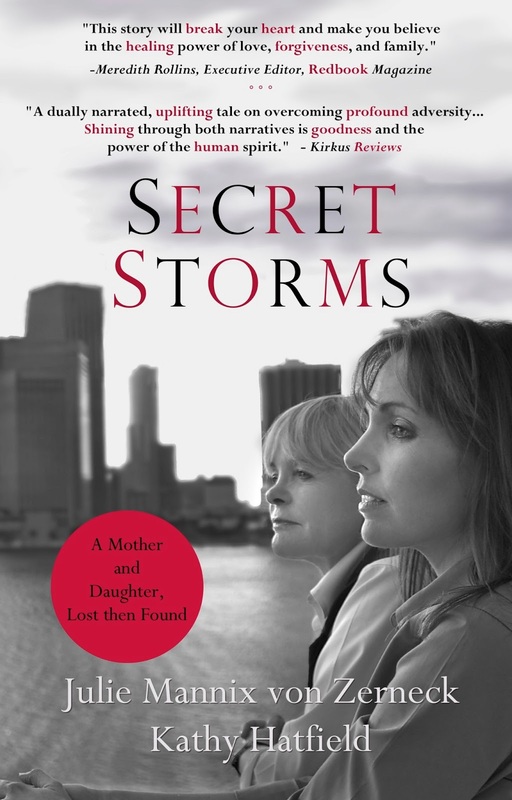 Secret Storms is divided into parts and each part alternates between Julie and Kathy as they reveal their own life histories and the events which led up to their being re-united with one another. It's a powerful story of faithful love, constant hope and redemption and I loved reading it. Every bit of it. Kathy's life wasn't as idealistic as Julie would have hoped for and preferred but Kathy verbalizes no complaints. Although she didn't grow up in a whole or always healthy family situation, she says her past is her own and gives her history and she has no regrets. That's a beautiful thing to say when one has been disappointed in parts. Julie wants to be a part of her eldest daughter's life but she is wise enough to know that she must take things slow and build trust. Kathy welcomes Julie's entrance into her world while respecting her adopted parents. The story is really quite beautiful. Now, not every birth family reconnection story is a pretty one and both Julie and Kathy acknowledge that. They aren't saying, "This is what adoption should look like in the end." They are merely saying, "This is our story and we have taken joy in it." This I can accept. They do not ignore the trials they have faced but instead they tell the reader what events drove them apart for decades and what events brought them back together in a way that expresses the fact that they do not take their relationship for granted. They know that their history is special and unique and they will delight in it in all the ways that they can. I think that's really beautiful and admirable. It should be noted that there is some language involved in the book. It's always in relation to quoting other people. They do not drop foul language for themselves but did see fit to include that of others. I don't know that I necessarily appreciate that but I didn't find it a turn off, given the individuals who they were quoting. I do want to note that though for anyone who is skittish about foul language. It exists, but it is minimal. Personally, I found Secret Storms fascinating and I'm very happy for the opportunity I was given to read it. Many thanks to Meryl Zegarek Public Relations, Inc. for shooting a copy my direction in exchange for my honest thoughts. It sounds like a beautiful book. I didn't recognize the actress you mentioned (before my time?) but the story sounds really good. Thanks for sharing it! I didn't recognize the actress, either, but the story sounds fascinating. I'm glad it worked out well for them.